T.J. Dillashaw is all about legacy these days. After vanquishing his former teammate Cody Garbrandt for the second time last August, Dillashaw started to move onto bigger and better goals — namely the pursuit of a second UFC championship. That’s why on Saturday night, Dillashaw will drop down to 125 pounds for a shot at flyweight champion Henry Cejudo. If Dillashaw is victorious, he would join Conor McGregor, Daniel Cormier and Amanda Nunes in the elite club for fighters who have held two division titles simultaneously in the UFC. As McGregor coined it after he was the first fighter in history to accomplish that feat — he became the ‘champ-champ’ but labels like that one don’t really concern Dillashaw as much as the more important goal he’s chasing with this fight. “It’s not just so much to be the champ-champ. It’s just to prove that I feel I’m the greatest pound-for-pound fighter in the world,” Dillashaw explained on Monday when speaking to media in Los Angeles. “I train very hard. I put everything in there. I’m a very well-rounded fighter and it’s about time to get to prove it. I can go down a weight, I can go up a weight, I can be at my weight class. In the middle of that quote, Dillashaw also mentioned the possibility that he could also move up a weight class to potentially pursue a third world title in the future. 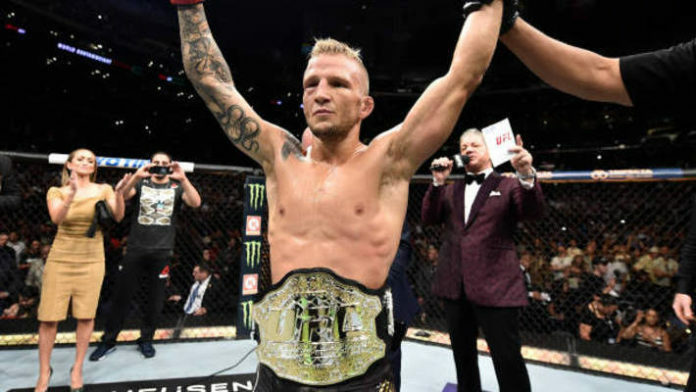 In fact, Dillashaw and his head coach Duane ‘Bang’ Ludwig have both talked about jumping at the opportunity to fight for a third division title by eventually moving up to featherweight and challenging current champion Max Holloway. With his flyweight title fight just days away, Dillashaw isn’t ready to start calling out Holloway just yet but he knows those are the kinds of challenges he needs to separate himself from every other athlete in mixed martial arts history. “You’ve got to have long term goals, you’ve gotta break records. How are you going to be the greatest of all time if you don’t?” Dillashaw said. Would TJ Dillashaw be considered the best pound-for-pound fighter in the sport with a win over Henry Cejudo? Sound off in the comments and let us know!